Michigan's motto is "If you Seek a Pleasant Peninsula, Look About You". With 4 Great Lakes on it's doorstep, romantic travel is easy here. All along the shore of Lake Michigan and inland, you'll find lots of attractions in the cities and great outdoors for romantic weekend getaways. Travel both the Upper and Lower Peninsulas, explore white sand beaches, lighthouses, Mackinac Island, Tahquamenon Falls, and of course, Detroit. The Best Time to Visit Michigan - probably early spring to autumn. If you're planning any romantic getaways here in late September to late October, the Fall foliage will make it a spectacular getaway. 1. Motown Historical Museum - see memorabilia from the Supremes, Jackson Five, The Temptations and many others. 2. Do a Pub Tour - Detroit is home to some excellent local beer, and The Handle Bar (734-277-2181) offers several pedal-powered "pub on wheels" tours of downtown bars (must be 21+). 3. 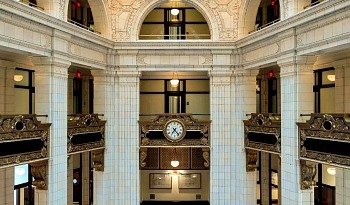 Greek Town - food and fun at one of Detroit's best shopping, entertainment and dining districts. 4. Detroit River Walk - this wide lakeside promenade is THE place for a romantic stroll along the water in the Motor City. 5. Eastern Market - if your travel in Michigan getaway finds you in Detroit on a Tuesday or Saturday, don't miss this excellent market. 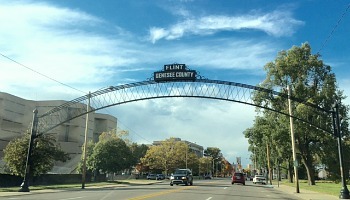 Flint - unassuming Flint, MI is actually more famous than you might think. 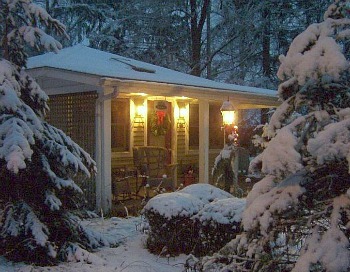 It's the home of filmmaker Michael Moore and his award-winning documentary Roger & Me. 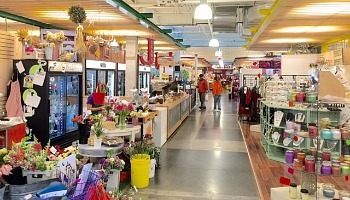 For romantic getaways here, there's the Flint Farmers Market (300 E. First St, Flint MI) which is full of local crafts, arts, produce and delicious eats (don't miss the delicious Bread Cheese). It's easy to put together your picnic lunch here, so why not take it to go and head out together to Stepping Stone Falls (5161 Branch Rd, Flint MI) for a scenic lunch by the water. Ann Arbor - "South Main" is the place to be here, with it's lively assortment of shops and cafes. After you've sampled a local craft beer at one of the pubs or experienced the awesome "Truffle Fries" at the Jolly Pumpkin (311 S. Main St), it's time to head out. Gallup Park Canoe Livery (boat and kayak rentals) or the Crazy Wisdom Tea Room are a couple of the spots romantics seek out in Ann Arbor. Wine & Chocolate Weekends in Michigan - couples looking for an afternoon of wine tasting can head down to the southern Michigan wineries (southwest of Kalamazoo around Coloma and Baroda, MI). Wine tasting and exploring the small art galleries and antique shops are a great day trip. At the Chocolate Garden in Coloma (2691 Friday Rd) you can sample some incredible handmade chocolate truffles that are receiving rave reviews everywhere! Michigan Whirlpool Suites & Hotel Rooms with Hot Tubs - celebrate your Michigan Honeymoon or Anniversary Getaway in style with one of these romantic whirlpool suites. The shores of the Great Lakes are where scenic lighthouses and resort towns abound in Michigan. You can board the ferry from Mackinaw City to Mackinac Island and it’s lovely Victorian village. Harbor Springs is a great spot to enjoy a cappuccino or picnic lunch for 2 on a park bench looking out on a scenic view of Lake Michigan. And the route on hwy M-119 (know as Tunnel of Trees) is a great reason to get back in the car. South Haven and St. Joseph are active little places with attractive galleries, B&B’s and great places to eat. Holland MI has got it's picturesque canals, specialty shops and dining. For scenic drives, the Lake Michigan Shoreline between Pentwater and Montague is very attractive. South Haven, Michigan Romantic Cottages - watch sunsets over the Lake from your private balcony, relax on sandy beaches just minutes from your doorstep. Beautiful & romantic cabins, A-frame waterfront cottages and more. Hidden Garden Cottages & Suites - If your Michigan getaway equation is "romantic cottage + fireplace + whirlpool tub", we have the answer here for you. 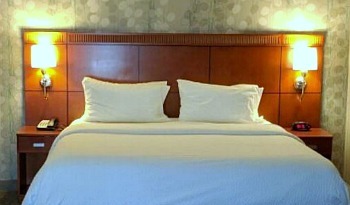 Saugatuck's most romantic small inn enjoys a perfect downtown location, four poster beds and in-room breakfast. The Grand Hotel on Mackinac Island in Michigan was named by the National Trust for Historic Preservation as one of twelve Distinctive Destinations. It has 385 rooms, no two of which are alike. There are several unique themed rooms, as well as suites and cottage rooms. Over the years, it has been the centerpiece of many Michigan romantic getaways and honeymoons. 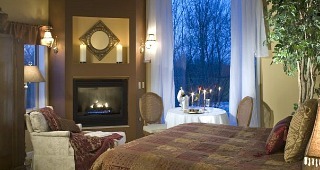 The anniversary package at the Grand Hotel starts at $1949 for non-lake views and $2395 for lake views (2013 Rates). You get a three-night stay, full breakfast and five-course dinner each day, fresh flowers, champagne and fudge. You also receive afternoon tea for two on one of the days of your stay and a one-hour private horse and carriage tour. A 10% discount on any future anniversary package stays is also included. Call 1-800-33-GRAND. Baysail - Appledore Tall Ships: Sail along in the comfort of a two-masted Schooner on Saginaw Bay and enjoy the sights along with a 3 course dinner. Detroit Princess Riverboat - weddings, moonlight cruises, Motown dinners and more, all on board Detroit's only romantic Riverboat. Tahquamenon Falls Wilderness Excursion - full days tour that starts with a ride through the Upper Peninsula forest on a narrow-guage railroad, then a 20 mile riverboat cruise to the spectacular upper Falls.